iLuv iMM190 review | What Hi-Fi? If you buy the iLuv iMM190, your first port of call should be Apple's App store. Here you'll find iLuv's dedicated app, designed with this dock in mind. It displays a large digital alarm clock as well as the weather. But the biggest draw for the app isn't the alarm clock functionality – after all, you've got this on your iPod Touch or iPhone as standard. This particular app comes equipped with SHOUTcast internet radio. Provided you're hooked up to a 3G or home network via wi-fi, you can search through a plethora of stations by genre or popularity. Bitrates are displayed for each station, so you can bypass those of shameful quality. 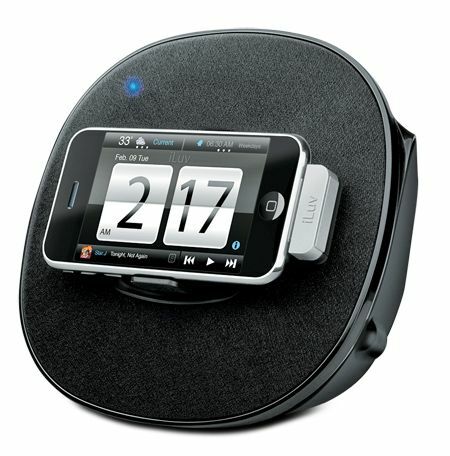 Twin this with the alarm clock function, and you can wake up to a stream of your favourite tunes. It's all presented in a neat little package. The internet radio had a few moments when playback wasn't as instantaneous as we'd have liked, but overall the app works well. Besides the supplied mains pack, you can slip in six AA batteries for complete portability. Connectivity is limited to a single 3.5mm input for connecting an external source that doesn't happen to be an Apple product. Snooze and volume buttons can be found along the edge of the speaker dock. You can switch the view from portrait to landscape by simply rolling the dock over. It's a secure fit, too, so there need be no concerns about your iDevice ever flying out. For such a reasonably priced iPod speaker dock, the iMM190 chucks out a surprisingly listenable sound. Top notes during The Black Eyed Peas Let's Get It Started sound on the bright side, but otherwise the speaker sounds upbeat and reasonably detailed. Despite not having the most meaty bass delivery, what is there sounds controlled and defined – which we'd take any day over woolly and indistinct.